A key agreement with Mexico that affects the level of Lake Mead, above, needs to be renegotiated this year. Photo by Ariel Wittenberg. President Trump's rocky relations with Mexico could have major consequences for the Colorado River and the 35 million Americans who rely on it for water. The Colorado River snakes its way through seven states, eventually crossing the U.S.-Mexico border. A bilateral agreement specifies exactly how much water Mexico receives, as well as other important factors like how those deliveries are reduced in years of exceptional drought. It is set to expire this year. The seven Colorado River Basin states — and particularly Lower Basin states Nevada, Arizona and California — say it's pivotal that the new administration finalize a new agreement. But many are now worried that U.S.-Mexico relations have already deteriorated to the point where that may be impossible. "The events of this week make me more apprehensive about the prospects" of reaching a new agreement, said Anne Castle, a former assistant secretary of the Interior for water and science during the Obama administration. She said a challenge for the new administration is separating the Colorado River issues between the United States and Mexico, which Castle described as a "win-win," from other binational issues. "There seems to be a demonizing of Mexico in general that is becoming more difficult to overcome," she said. The seven Colorado River basin states are hoping to finalize drought contingency plans this year. Map by E&E News. 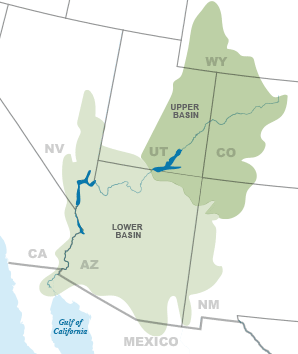 A 1944 treaty between the two countries requires the United States to deliver 1.5 million acre-feet of Colorado River water to Mexico annually. It said that amount can be reduced during times of exceptional drought, but it did not define what an exceptional drought is, or how much those deliveries could be curtailed during one. Amendments to the treaty have since clarified. The current one, 2012's Minute 319, laid out those terms. It tied the deliveries to the volume of water in Lake Mead behind the Hoover Dam, America's largest reservoir and the primary storage facility for the Lower Basin states. It also allowed Mexico to store water in Lake Mead. Minute 319 expires at the end of 2017, which has led to negotiations over a new amendment commonly referred to as Minute 32x. All parties in the Colorado River Basin say it is critical that Minute 32x be finalized. It would again set the terms of water delivery and define exceptional drought. That's particularly important now because the basin is in the midst of a 17-year drought. 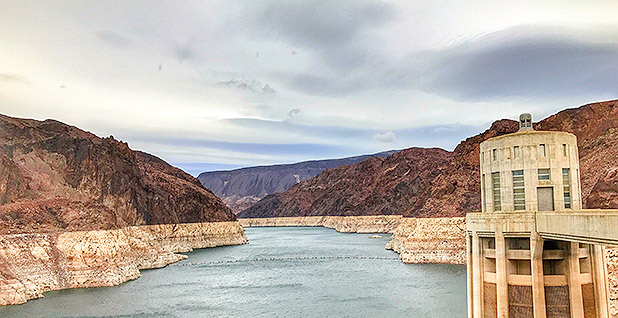 Further, scientists estimate there is a 50-50 chance that Lake Mead will drop below an elevation this year that would trigger drought contingency conditions along the river, including reduced deliveries. Defining those terms with Mexico and allowing it to store water in Lake Mead — which would help keep the lake above the 1,075-feet elevation trigger point — are critical. The Obama administration worked hard to finish the negotiations but ran out of time, Castle said. Then, last week, Trump's relationship with Mexico got off to a shaky start. Mexican President Enrique Peña Nieto canceled a planned meeting over Trump's plan to build a wall between the two countries amid suggestions that Mexico would pay for it through a 20 percent import tax on Mexican goods. Since Trump's election, Mexico has also replaced its foreign minister and U.S. ambassador, both of whom had been intimately involved in the Minute 32x negotiations. Those developments have alarmed key Colorado River players. "Reports the last couple days are not the kind of footing that you would expect to provide a really good foundation for these talks," said James Eklund, director of the Colorado Water Conservation Board. Failure to finalize Minute 32x would have important consequences. Tom Buschatzke, director of the Arizona Department of Water Resources, said the current minute proposal would define Mexico's shortages in a drought and make them proportional to how much Arizona must curtail its use. Arizona relies on the Colorado River for about 40 percent of its water. "There are many, many terms of Minute 32x that are hugely beneficial to the state of Arizona," he said. "This is a very positive thing." If there is no new agreement, several problems could occur. For example, if Lake Mead hits the 1,075-feet trigger, the United States could decide unilaterally to begin reducing the amount of water that reaches Mexico. Such a decision could have "broad geopolitical implications," according to a white paper from the Colorado River Future Project based on interviews with 65 key players that was released shortly before the election. There are other Colorado River issues on which the Trump administration needs to play a leading role, observers say. Before Minute 32x can be finalized, the seven basin states — and particularly the Lower Basin states — need to finalize a drought contingency plan, or DCP, for what happens if and when Lake Mead drops below 1,075 feet. The Obama administration worked toward finalizing that document but similarly came up short. If an agreement isn't finished, the stage could be set for litigation and conflicts between the states if Lake Mead drops. Recently, California's largest lake, the Salton Sea, has become a sticking point in the DCP negotiations. The Salton Sea lies in the Imperial and Coachella valleys in the southeast corner of the state. The lake was once a tourist hot spot, but a complicated 2003 water transfer from the agricultural area surrounding the lake to San Diego has significantly reduced inflows to the lake, causing it to dry up. As the lake has receded, it has exposed a massive lake bed that emits toxic dust during windstorms, creating a major public health risk. And under the terms of that agreement, water flowing into the lake will again be reduced by the end of 2017. At the time of the agreement, California vowed to take action to address those public health concerns. In nearly 15 years, however, it has done very little (Greenwire, June 13, 2016). IID says it won't sign onto a DCP until it sees a plan from the state to address air pollution at the Salton Sea. "For IID to take part in a DCP for the Lower Basin," said IID General Manager Kevin Kelley, "we're going to have to know that we've got a coherent going-forward plan for at least the next 10 years." California is working to come up with such a plan, according to state officials. But a big problem is cost. California has set aside about $80 million for mitigation efforts in its most recent budget, and the Obama administration pledged another $30 million before leaving office. But most expect mitigating the likely 38,000 acres of exposed lake bed to cost at least $1 billion. That has put IID and the Salton Sea in a critical position for progress on the Colorado River. "The Salton Sea went from being an issue that was on the back burner for a lot of people to the front of the line," said Douglas Kenney, director of the Western water program at the University of Colorado's Getches-Wilkinson Natural Resources Law Center. "It went from this quirky, very isolated issue to being front and center." Despite Trump's rough start with Mexico, some still see causes for optimism. They note that water should be a nonpartisan issue, and that even the Israelis and Palestinians cooperate when it comes to managing water in the Middle East. "The shift in politics doesn't change the fact that the reservoir system in the Colorado system is half-empty," said Jennifer Pitt of the National Audubon Society, who has been a key player in Colorado River negotiations for years. "What gives me confidence that there will be a path forward is there are seven states that really would like to see this sort of continued collaboration with Mexico in increasing the reliability of Colorado River water supply." For many key players, though, there have been few hints from the new administration about what role it will play. "The bigger question in the Colorado Basin for a lot of people is not a concern that a Trump administration would come in and try to push some strong agenda, but that the administration might just disappear on Western water issues," said Kenney. He noted that the Obama administration was very active in trying to broker these agreements. "What if that just goes away?" he asked.